A penny that a Massachusetts teenager found in his change from lunch money could be worth as much as $1.65 million when it is auctioned off. The 1943 Lincoln penny is made up of copper and has been described as the “most famous” coin made in error, according to Heritage Auctions, which is auctioning off the coin. Only 20 were ever made and for years the U.S. government denied its existence, but one coin was found by Don Lutes Jr. in his school cafeteria in March 1947. In the 1940s, copper was considered a strategic metal, largely because of World War II, as it was used to make shell casings, telephone wire and other wartime necessities. To preserve the metal, 1943 Lincoln pennies were made of zinc-coated steel, but a tiny fraction of the pennies put into circulation wound up using copper. Almost as soon as the pennies were pressed, rumors began to emerge that some copper cents had made their way into circulation. The frenzy had become so heightened that it was speculated that car magnate Henry Ford would give a new car to anyone who could give him one of these copper pennies, though that speculation was later proven false. The rumors of the copper penny, described as “the Holy Grail of mint errors,” were eventually proven true after it was found out that copper planchets – which are actually made of bronze – had become lodged in the trap doors of the mobile tote bins used to feed blank coins in the presses at the end of 1942. The planchets went unnoticed and eventually “became dislodged and were fed into the coin press, along with the wartime steel blanks,” Heritage wrote on its website. Other genuine examples of the 1943 Lincoln copper penny have been found, including 10-15 from the Philadelphia Mint, a half dozen from the San Francisco Mint and one from the Denver Mint. At the time, Lutes, who was 16, had heard of the rumor about Ford, but when he was later told it was false, kept the coin for himself in his collection. Over the years, he received offers for the coin and eventually even inquired with the U.S. Treasury about it, but was told that it was fraudulent, that “All pennies struck in 1943 were zinc coated steel” and eventually decided to just keep it for his collection. Before the switch took place, a handful of cents were mistakenly minted in copper, making a 1943 Bronze Lincoln cent coin one of the most famous coins in U.S. history: 76 years later, the very first of these error coins ever discovered will make history when Heritage Auctions offers the rarity Jan. 10 in Orlando, Florida. The 1943 zinc-coated steel pennies proved to be so unpopular with the public that they were eventually replaced with brass recovered from shell casings. 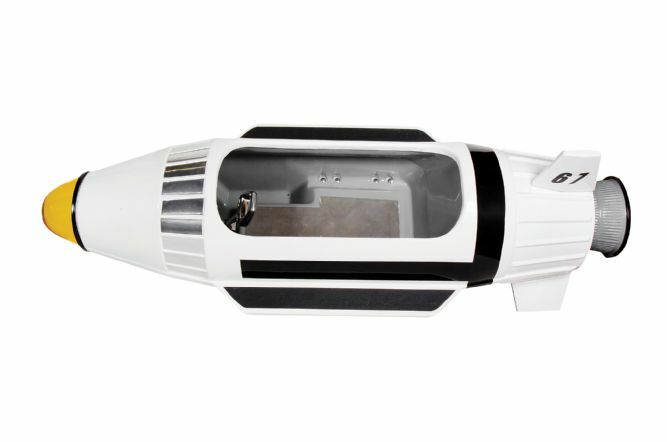 The auction is ongoing and is slated to end on January 10. 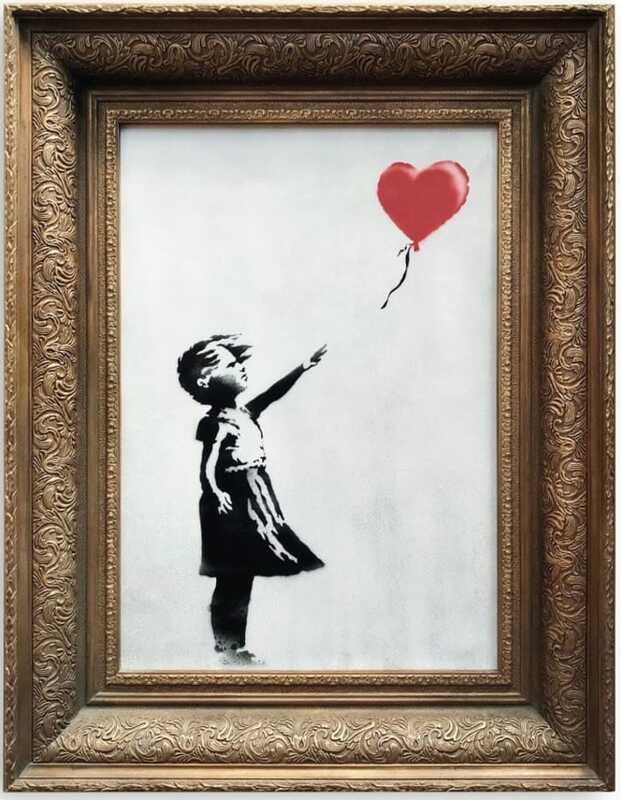 Here is a list of the top 10 most expensive original comic art ever sold. The increasing popularity of original comic art has resulted in seven figure price tags for certain pieces of art. 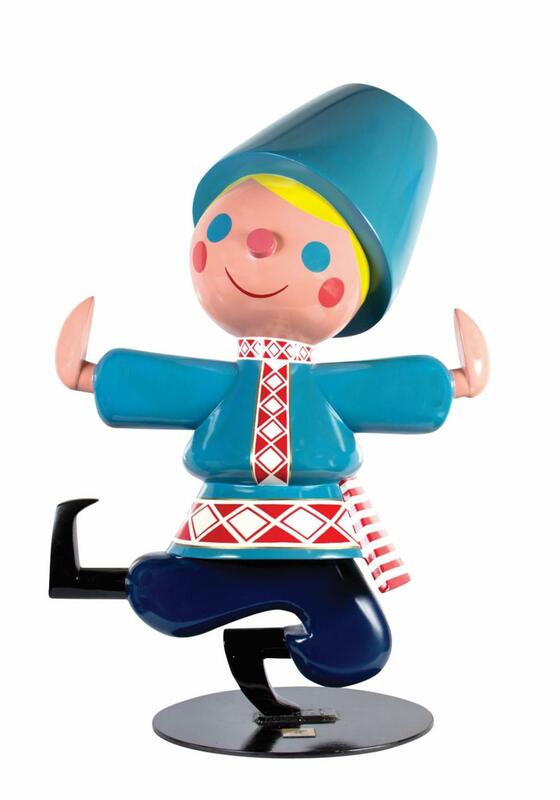 Three of these top 10 pieces were sold recently this year in 2018! This cover art by Frank Frazetta was sold for $1,792,500 on May 10, 2018. This cover by Robert Crumb sold for $717,000 on May 18, 2017. This cover by Todd McFarlane sold for $657,250 on Jul 26, 2012. Many of Todd McFarlane’s Spider-Man covers fetch a hefty price. This art page by Herb Trimpe and Jack Abel sold for $657,250 on May 16, 2014. It features the first appearance of Wolverine. This original art cover by Frank Miller sold for $478,000 on Aug 2, 2013. 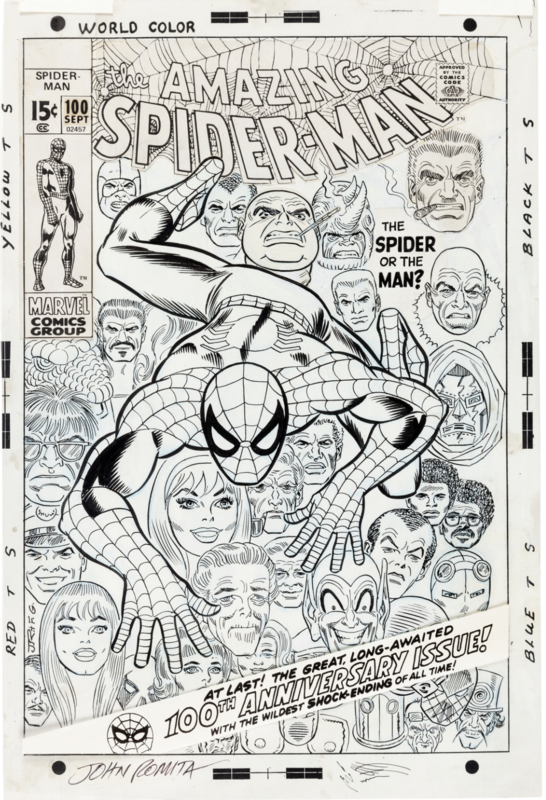 This Spider-Man cover art by John Romita Sr. and Frank Giacoia sold for $478,000 on Feb 23, 2018. This original art splash page was created by Frank Miller and Klaus Janson and sold for $448,125 on May 5, 2011. This original art cover created by Neal Adams sold for $442,150 on Nov 20, 2015. This is a more recent high price sale for a Tintin page by Hergé (Georges Rémi). 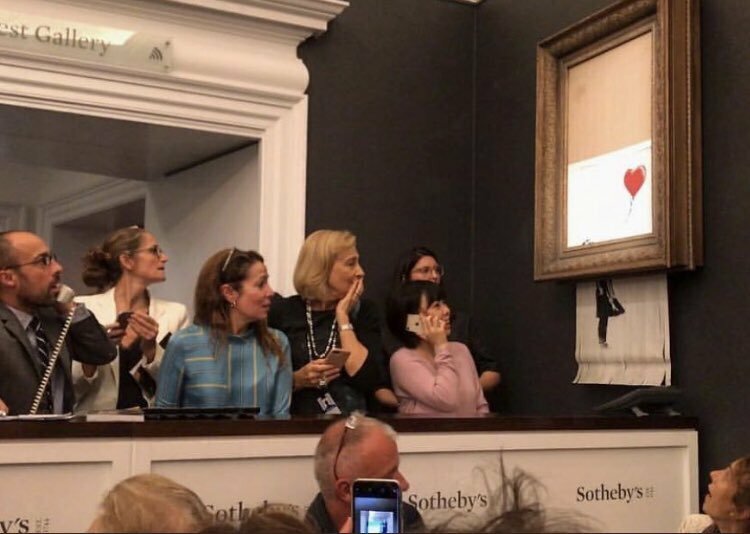 It sold for $425,000 on Jun 2, 2018. 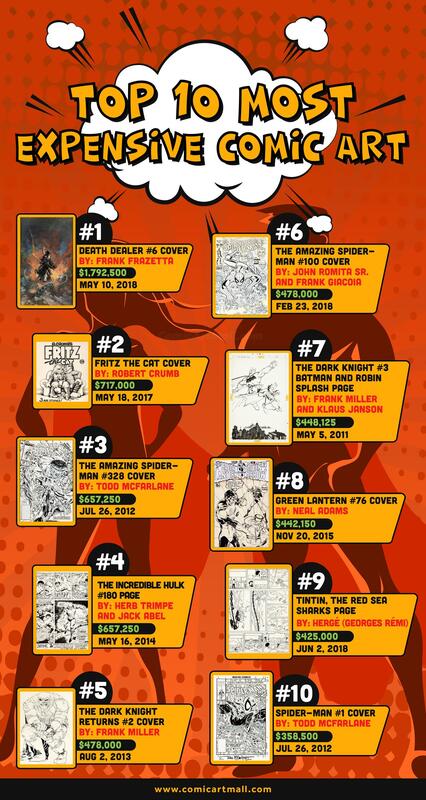 Another Todd McFarlane cover makes it to the top 10. 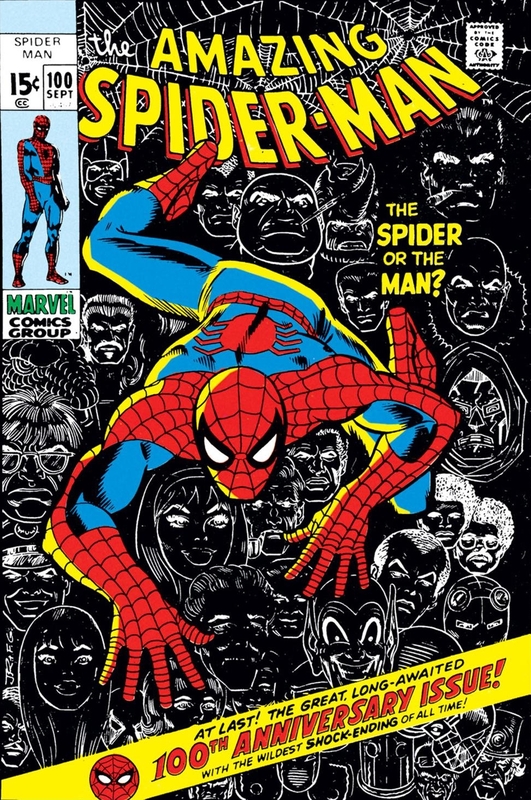 This Spider-Man cover sold for $358,500 on Jul 26, 2012. 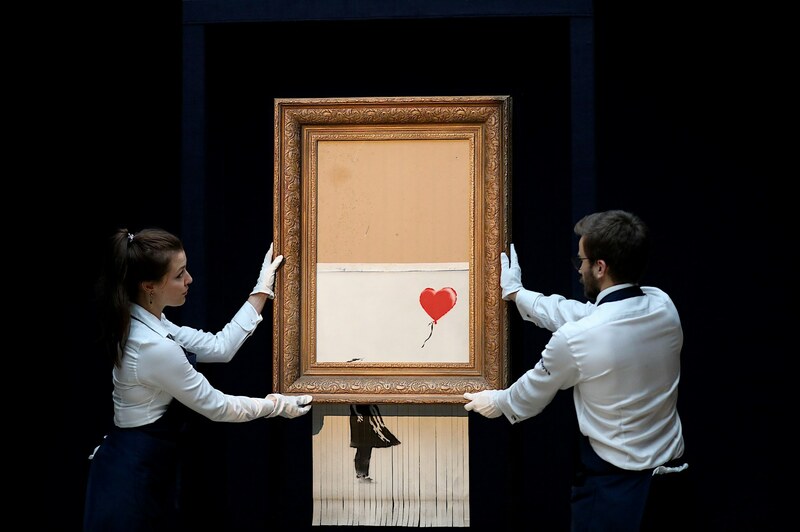 Yesterday Sotheby’s in London held an auction for the iconic Banksy painting “Girl With Balloon (2006)” and as soon the auction completed for £1,042,000 ($1.4 million), the special “artist’s frame” created by Banksy that held the painting proceeded to shred the famous work of art. 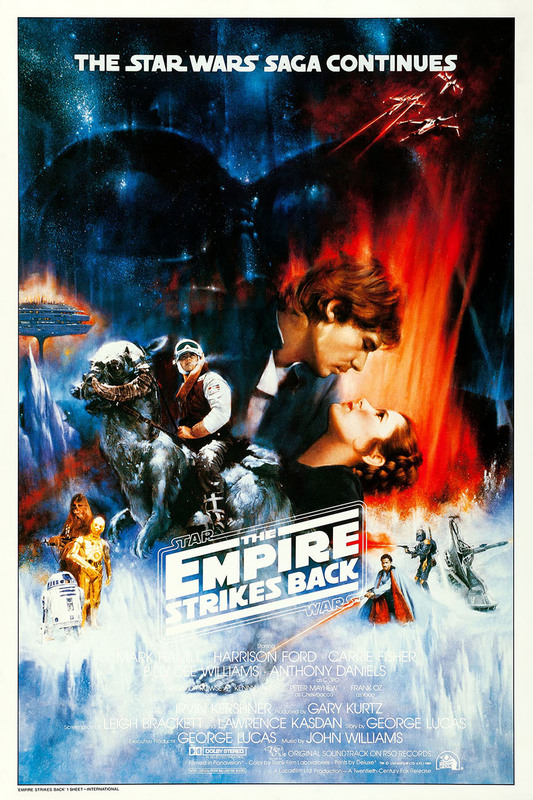 A rare Star Wars concept poster printed for the 1980 sequel The Empire Strikes Back sold Sunday for $26,400 at Heritage Auctions, setting a world record as the most expensive movie poster from the space opera ever sold at auction. 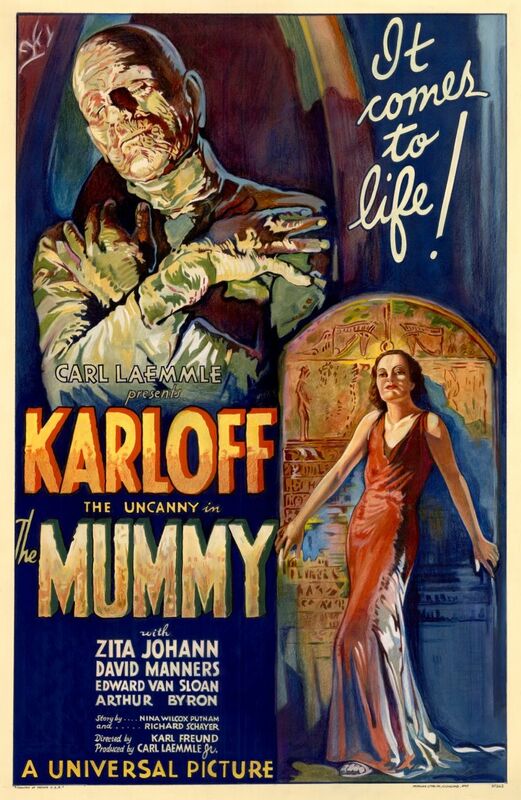 The poster was estimated to sell for between $5,000 and $10,000 in Heritage Auctions’ Movie Poster Auction, which realized more than $1.6 million. One of a handful of original examples known to exist, the poster was a trial run featuring art by artist Roger Kastel. Kastel took inspiration from a poster for Gone with the Wind for the film’s 1974 re-release. That poster features an image of Clark Gable carrying Vivien Leigh surrounded by flames. In Kastel’s poster, characters Han Solo and Princess Leia Organa share a similar embrace while surrounded by action scenes and a menacing visage of villain Darth Vader. Perhaps done as a test printing of the International edition of the poster, this version includes images of Lando Calrissian, Boba Fett, Cloud City and more. 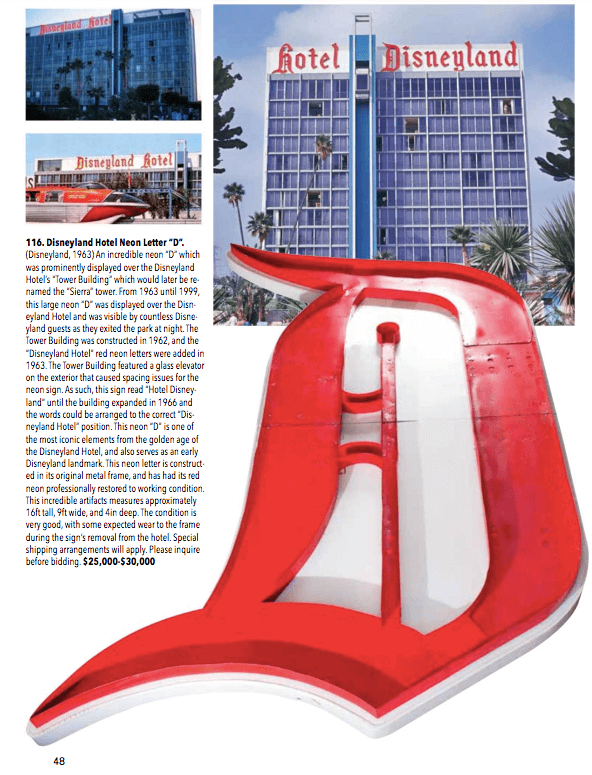 When the studio made their final revisions, those additional elements were removed from the original Kastel design, as they were considered too busy. The studio also went with a darker color scheme of mostly blues and purples, losing the vibrant reds and oranges from Kastel’s original vision. 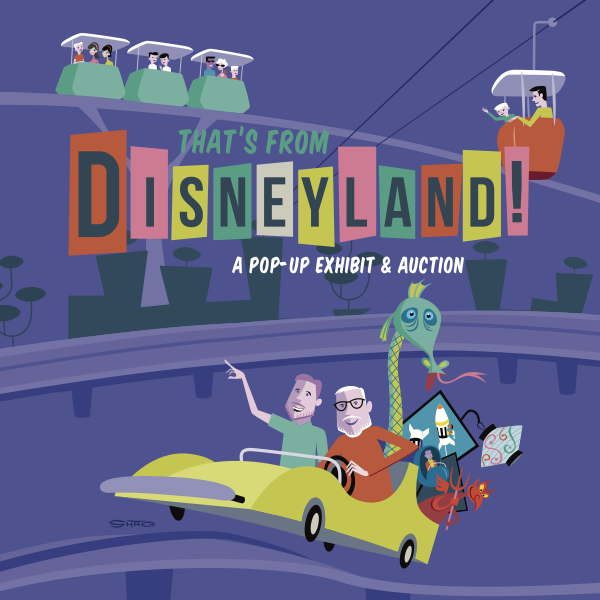 Van Eaton Galleries is ecstatic to present “That’s from Disneyland”…an incredible two day auction featuring the collection of Richard Kraft, mega collector and Disneyland enthusiast. 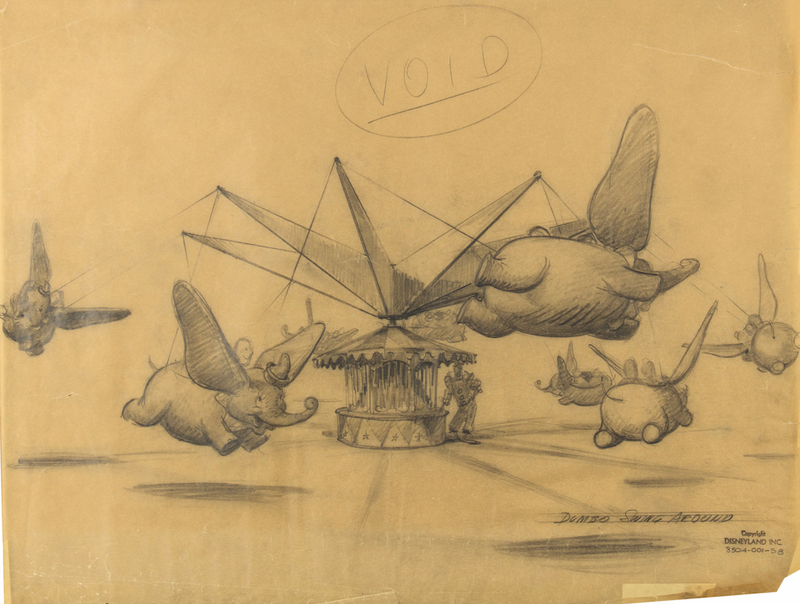 Featuring original pre-1955 concept art, ride vehicles, props, attraction posters, paper goods, toys and more. 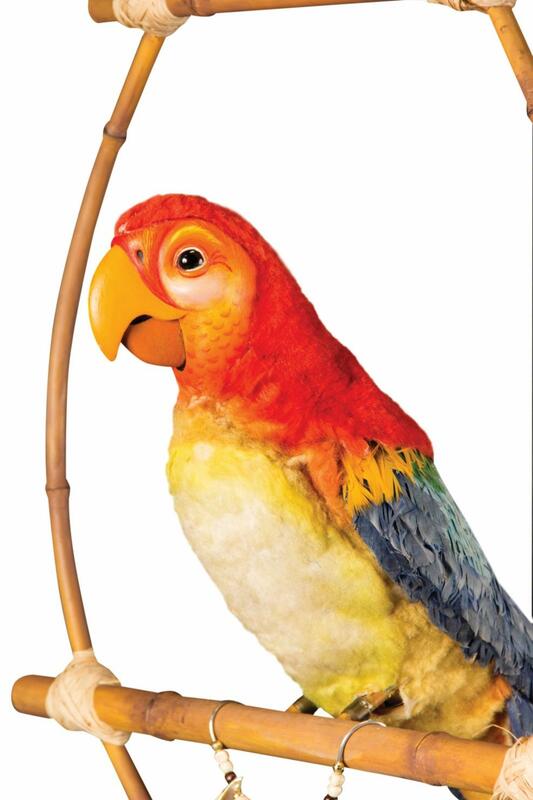 This auction represents one of the largest collections of its kind in the world. 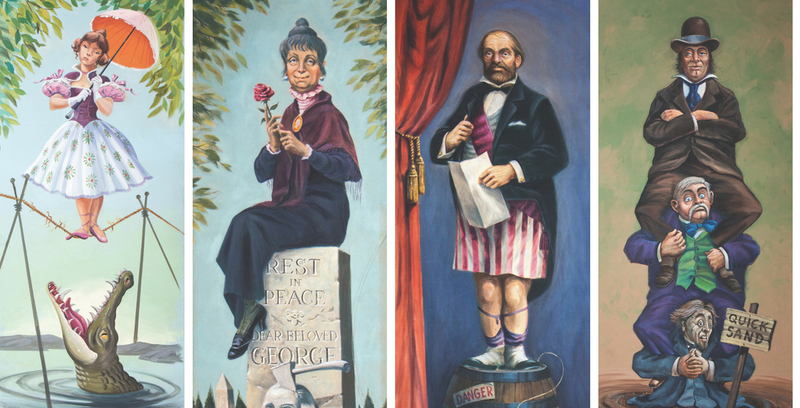 Housed at an abandoned sporting goods store in Sherman Oaks, this is a free pop-up Exhibition from August 1st through the 24th, with a live auction scheduled for the 25th and 26th of August! Special events and concerts are scheduled throughout the month, see below. This is an event not to be missed! 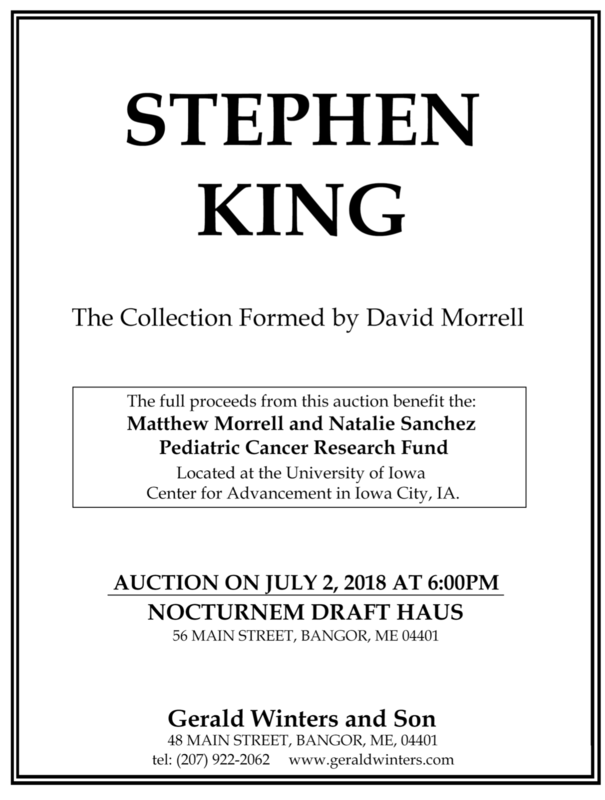 On July 2, the Nocturnem Draft Haus in Bangor, Maine will host a first-of-its-kind event, to raise money for pediatric cancer research. 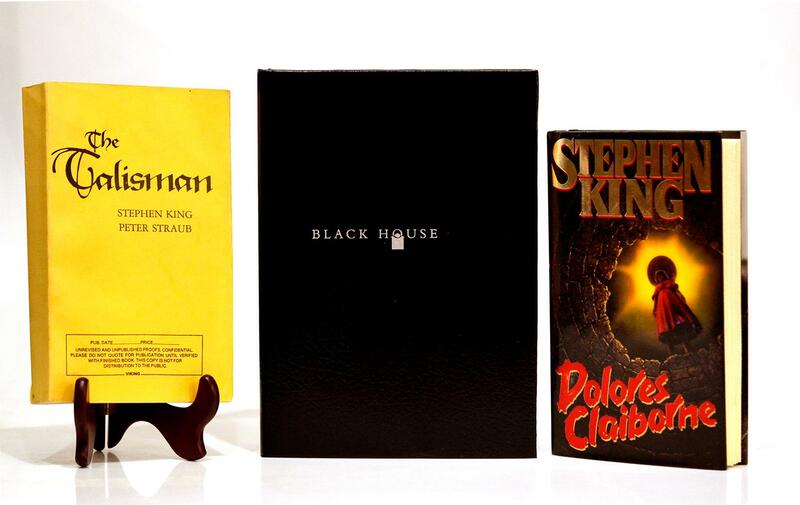 Bookstore owner Gerald Winters was chosen by David, Donna and Sarie Morrell, to help them with a historic Stephen King event. The Matt Morrell and Natalie Sanchez Pediatric Cancer Research fund—located at the University of Iowa Hospital and Clinics in Iowa City, IA—provides grassroots funding for the Pediatric Oncology Department to aid research for improved treatments and cures of Ewing’s sarcoma and the Sarcoma Family of Tumors, as well as other cancers which may benefit from advanced research of this disease. In 1987, David’s son Matthew died from Ewing’s sarcoma at the age of 15. In 2009, his granddaughter Natalie Sanchez died from same disease at the age of 14. 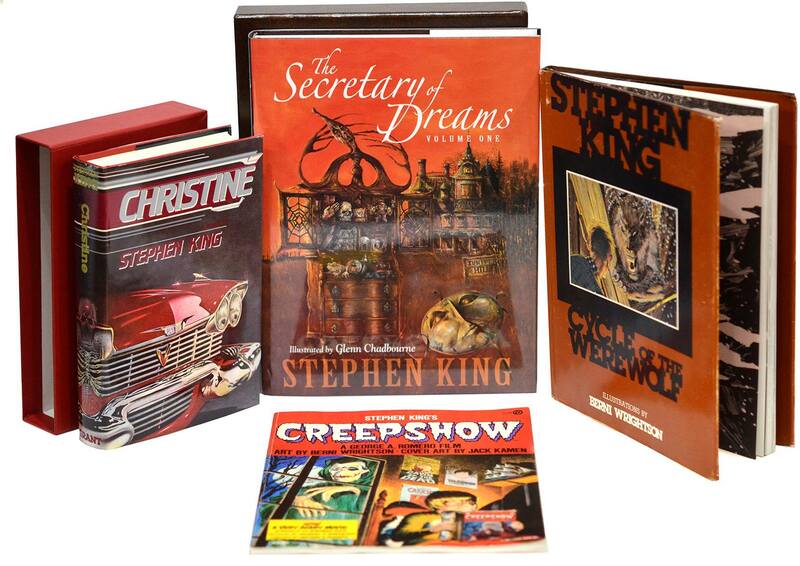 Through the generosity of the Morrell family, as well as Stephen King who graciously signed his original manuscripts, this auction will offer for the first time in history, eight autographed Stephen King typescripts (including the 1566 pages of IT), two uncorrected proofs, and nearly two dozen more signed, limited editions, first editions, and one creepy horror magazine. 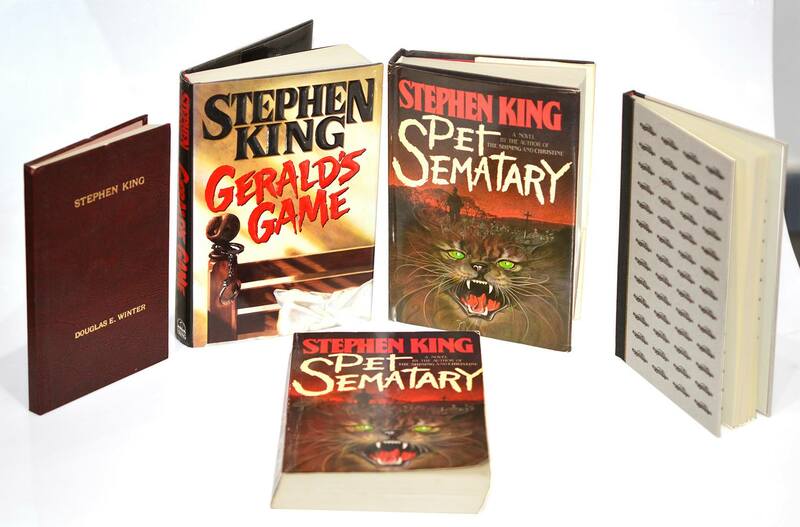 Some of these typescripts have never been seen by people outside of the Morrell family, and Stephen King’s family, and will probably never be available again. 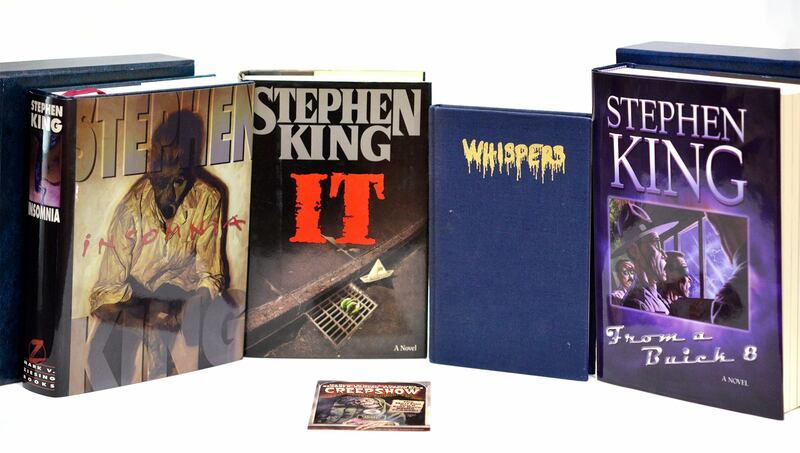 If you love to read or collect the vast works of Stephen King, or David Morrell, or you simply wish to support a great endeavor that survives on the donations of caring individuals such as yourself, this is an event that you do not want to miss. On the night of the auction, and through this website, donors to the fund will receive a signed first edition of David Morrell’s Fireflies: A Father’s Tale of Love and Loss, about Matt, his illness, the valiant staff at the University of Iowa Hospitals and Clinics, and grief. 100% of the proceeds will go directly to the fund. 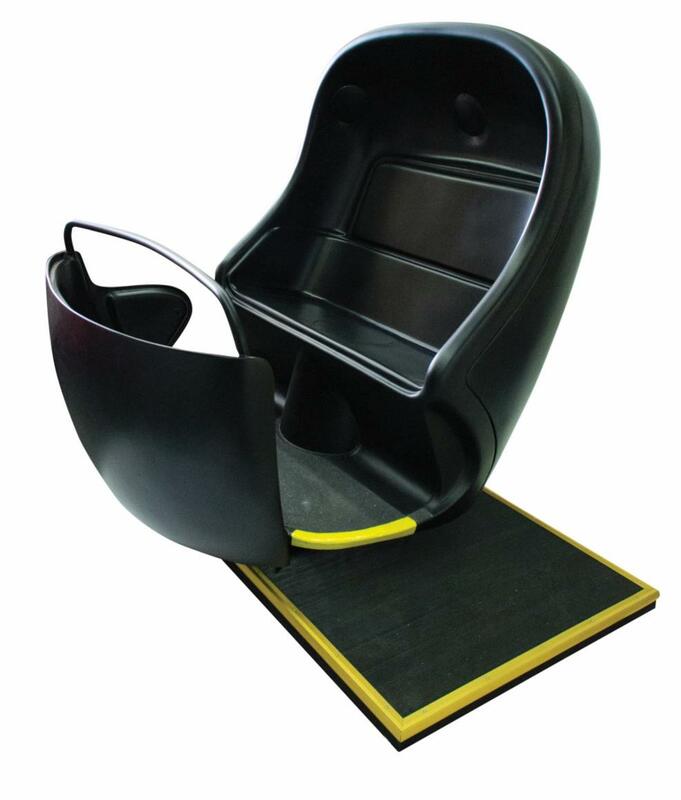 If you would like to see which items will be auctioned or get more information, please click HERE. The Original Cover Art from The Amazing Spider-Man #100 – considered one of the most iconic covers of the 1970s – could sell for as much as $300,000 in Heritage Auctions’ winter Comics & Comic Art event February 22-24. 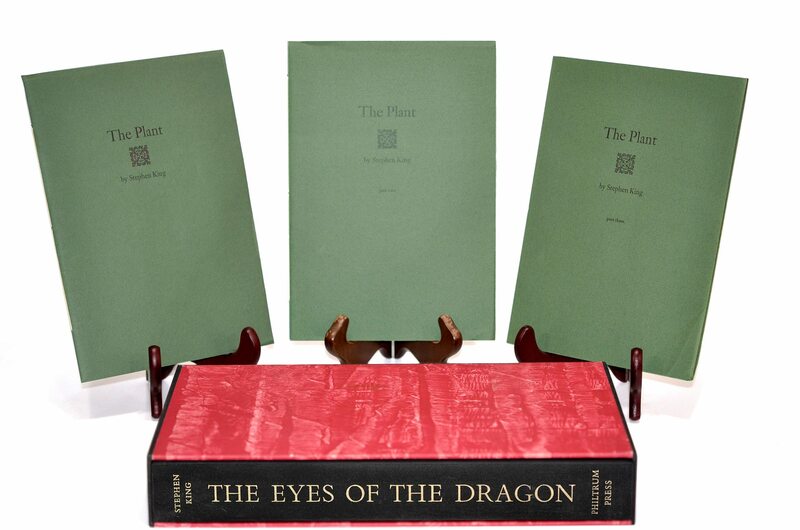 Brimming with fresh-to-market high-grade vintage books, the auction features rarely seen art, such as Frank Frazetta’s Tree of Life Original Painting (est. 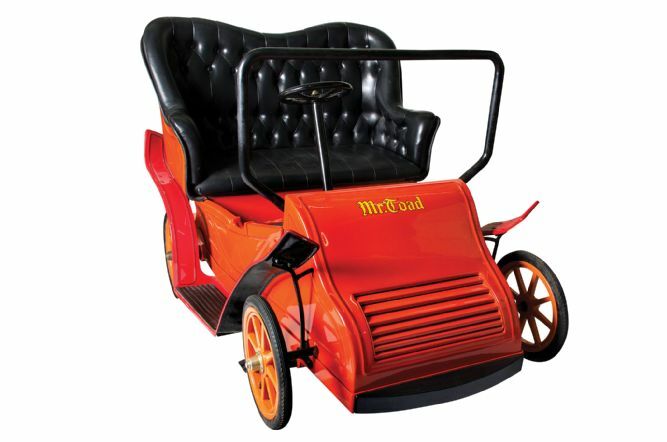 $300,000). Artists John Romita Sr.’s and Frank Giacoia’s cover art for The Amazing Spider-Man #100 masterfully portrays Spidey and dozens of famous canon characters and marks the first time the artwork has ever been offered at auction. Collaborating with the legendary Stan Lee, the two understood the anniversary issue’s cover needed to be a masterpiece. Historians and fans alike rank the cover among the most influential of all time.